Soak the sun-dried tomatoes in water for 5 minutes, then drain the water and finely chop the tomatoes. To make a flax ‘egg’, mix the water and ground flaxseeds together in a small bowl and leave for a few minutes. Heat 2 tablespoons of the oil in a frying pan set on a high heat. Add the onion and garlic and cook for 1 minute. Add the mushrooms and soy sauce and cook for 2 to 3 minutes, until they start to smell fantastic and are nice and brown. Now it’s time to get your sauce on. Place the chopped tomatoes, maple syrup or honey, and a pinch of salt in a separate medium pan on a medium heat, stirring occasionally. Meanwhile, to make the beetballs, add the mushroom mix to a large mixing bowl along with the sun dried tomatoes, flax ‘egg’, kidney beans, breadcrumbs, grated beetroot and parsley. Mix well and form into 12 balls a little bigger than a golf ball. They should stick together. Heat the remaining tablespoon of oil in the frying pan you cooked the mushrooms in. Fry the beetballs on a high heat, stirring regularly, until they start to turn golden. This should only take a couple of minutes for each ball. Cook them in batches if necessary. While these are frying, finish your sauce by adding the sundried tomato pesto, if using, and mixing well, then remove from the heat. 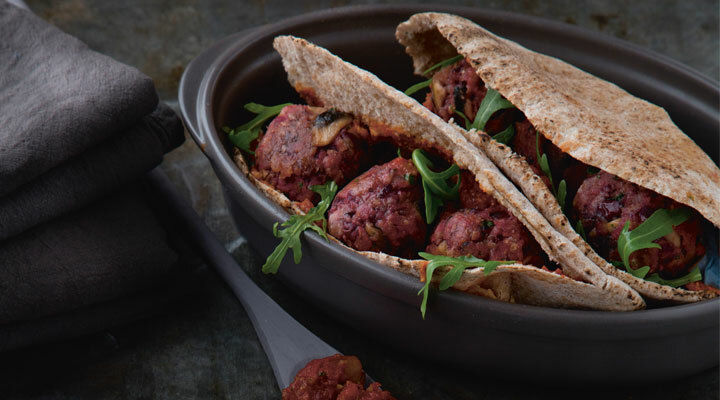 Spread some tomato sauce in each halved pitta. Add three meatballs to each sub, garnish with a little rocket and enjoy.